*diosdado "daddy" yutuc - THANK YOU daddy for being a sport especially whenever I tease you about the world war I and whenever I ask you what it's like to be a part of Bataan Death March (lol) . Thank you for all those times that you just laugh about it and by updating us with the lives of those "bomba stars" you know since the 80's. Thanks for letting me know the names of those bomba stars that made it big on showbizness at that era when Filipinos regard those with "betamax" as rich. Hahaha! Thanks for describing how Manila looks like before the war. Bwahahahaha! *arnaldo "arn arn" tamayo - thank you also for those times you laugh about our "lov e team" hahaah! I am really proud that even in my small little way, I was able to impart my knowledge to you on how to pass your scorecard as you have been my team buddy. I know you are a man of few words (without the spirit of red horse, hahaha) so we are not able to bond that well because we're opposites but I hope when we again see each other at the office...you would still take time to greet me. *emmanuel "emmanrito" santos - what I love about this kid is that he is so "makulit" and "kwela" like me. I can see in him a younger brother - a cheerful, bubbly full of life younger brother. I love to see him laugh when I crack jokes to him as he would for sure would find a joke of his own that would make all of us laugh. I always tell him that he is "gwapo" and he looks like " richard....pinlac" though I mean Richard Gomez talaga. For me he is a true example of a yuppie who is soooo maloko. Keep it up Emman and thanks for those times you make me laugh with your childish acts. *sharen "shai" cariaso - friend! thanks for all the troubleshooting steps you've taught me and the colorful quickcomm fonts you generously share, hehehe.Thanks for the wonderful pc set I've purchased from you na super "sale" na binigay mo sakin. thanks for being nice to jojo when he came to get the pc. thanks for all of your kakalerky na stories and for just being you. Looking forward for more kalokang adventures with our new team. *lovee "qsp killer" martos - although we never really had the chance to bond that much...at least we had that 10 minute "serious" talk on our way home ... that is more than enough for me. Before I really don't know who the real Lovee is...but now, I think I already have a clue...a loving mother and a straightforward kind of friend that would tell you your faults straight to your face. I regret not being able to talk to you that often before but I know it's not too late...we can still chat as we still is in the same company. Maybe we'll have more time in CVG UP, right? Good Luck Lovee...you deserve to be happy....promise! *archie "koya" paler - ati would definitely gonna miss you koya! wala nang partner sa asaran si ati nyan! nyahahahaa! Archie or koya as i fondly call him is really someone na sobrang mamimiss ko sa team ( I know Gherj and Ice would also agree to me) because he makes us laugh all the time. I call him koya because he looks like my "brother in law" who is now based in Singapore. My brother in law is also a joker like him that's why I really see a family in Koya Archie. I admit, when Im still a newbie in the team, I am not comfortable speaking with him - so it took me about 6 months to finally know Mr. Archie Paler. 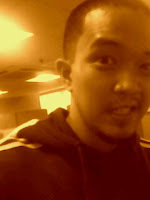 If I only knew my CVG life would be better with such a joker as koya...I should not have waisted those first 6 months! Koya is like me... no pretentions, what you see is what you get. We can laugh about the simplest thing there is and we love making "lait" each other. Hahaha! Koya, magkikita pa rin tyo hayup ka! Hehehehehe. Remember, wag ikahiya ang pimpols...pinagpuyatan mo yan! okey? nayayayayaa! continuation tomorrow...im soo sleepy....it's already 1:45 am. morning! *gherjeane "gherj" gonzales - gherj is one of a kind. She's one of my closest friends in CVG but till now...there is still a certain part of Gherj that I can't read, maybe because we do have two different personalites. She is a self acclaimed "certified sensitive" and ako naman is a self acclaimed "kafal muks". As I mentioned, you need to handle her with care as she is so fragile (baby nga ang tawag namin sa kanya eh...hehehe). Sobrang generous and a kind of friend who would stick with you no matter what. Andami kong natututunan dito sa techy girl na itech and no dull moments when I'm with her...kasi me tagatawa ako hahahaah! Thank you Gherj for all of the wonderful memories weve shared with team Kuripsy and looking forward for new more adventures with team Paul. *birl worley "burdagul" de guzman - burdagul as we fondly call him is a kind of guy with a certain personality that only a guy like him could handle. He is not afraid of showing what his fashion sense is....from the very famous suspender, to the leather bolero vest and his signature leather hat. From his fit sandos, to his barbells and jogging sessions every 3:00 am while on lunch break. Only Burdagul can do that! He is jack of all trades and most of the time...he does makes sense. how can I forget a former teammate who is soooo into technical stuff that he dares to check those tiny little components of a 2wire modem for research purposes. A guy with different personalities and hundreds of interesting stories to tell. Gogogo Birl! *ivy "jennilyn" vivero - my twin sister. She is a kind of friend I could confide with anything that's happening to my life. I love her stories especially when it comes to her life... whenever I talk to her usually during lunch breaks, avail time and yosi breaks...I come to know more and more of her. She does'[nt know how she inspired me to be a tough person like she is and kahit na magalit ka... I treat you as my real ate hahaha!. Thank you dear friend for everything and I hope we could still bond though were not a part of the same team anymore. I hope you already find that perfect guy who is deserving of our lahi. hehehe. I'll gonna miss you jennilyn! *pedro "papang" sarcia - Papang...as we fondly call him is one of my true wavemates from 10.1 - He is a certified Electronics and Communications Engineer! Though he is indeed Engr. Sarcia - he never boasted about his title. A self acclaimed "Indian American" and a very techy person. I know that deep within him is a guy truly in love as he never fails to visit her girlfriend which is based in Batangas whenever he had the time. He often teases me about chatting with loverboi69 and never fails to associate our conversations with webcam and tapis. Hahaha. Though he often denies his true age...we already know the truth...36! No need to deny it papang - Maybelle told us! *aisah "nora" regro - also one of my original wavemates and one of my closest friends in CVG. She's like a younger sister to me and the truth is, kahit magalit sya - I can see myself in her 7 years ago. Like Emman, she is vibrant and full of energy maybe because is in only 21 years old. We often laugh about anything and she does have her own special way to draw people near her. A tough girl, that inspite of all the problems she encountered in life...she is still fighting really hard to survive. A very intelligent girl with a wide vocabulary and an extra muscle (like gherj) that moves whenever she see's cute guys. I'm happy that we are still together on the same team. I'm so happy that I've had the chance to know you guys and thank you for being a part of my daily life for almost one and a half years. We'll gonna see each other again for sure and I hope we could still go out sometimes. THANK YOU TEAM KURIPSY KREMES FOR ALL THE MEMORIES...CU AROUND! Hi Can we exlinks? Plz let me know when you're done thanks. hi lance, yeah mimilanie and emotera is one and the same...hahaha! thanks for dropping by. have added u in my blogroll.good observation there. thanks! Is it 'emotera' that i am seeing on those pics? i don't know.. she looks similar.. this is her page, www.emotera.com"
just came home at around 6pm from the office. it's mark yu's birthday today (?) and i'm lucky to have a free lunch courtesy of the birthday boy plus a dessert of krispy kremes doughnuts. Deny to death ang bakla na near 30 na sya eh isang taon lang naman ang tinanda ko sa hitad. (bakla is just an expression but si mark yu ay isa sa mga kakaunti kong friends sa cvg na straight talaga, nga ba? nyahahaaha) Nagdate sila ni Ice sa Kitchen (uyyy something fishy there) and nagpatake out nalang ako ng double cheezeburger and fries. lately kasi di na ako kumakain ng rice puro bread lang. diet? himala! hahaha. Inokray okray niya yung phone ko eh nokia8810 lang naman yung sa kanya - at sinira pa yung stylus ko. hmp! pero kahit na inokray okray ako eh lab ko parin sya kasi dinalhan nya ako ng lunch. o sya post ko picture nya dito na kinunan niya mismo sa inokray okray nyang china phone ko hehehe. HAPPY BIRTHDAY MARK!